The folks at Marvy were so generous and sent me a set of Le Plume markers. They are alcohol markers like Copics, and blend beautifully. I used them to color the plane (from Plane and Simple,) the edge of the clouds, and the banner. I will definitely be reaching for them again! The custom sentiment was a labor of love. I saw it on a chalkboard print and wanted to recreate it on my card. The latter part was easy - I used Riley's ABCs to spell out AIRPLANES FLY. No problemo. For the first half, that I slipped into the banner, I spliced letters and words together from Sewn With Love. What you see here is not my first try, but I thought the sentiment was so sweet and I'm a little stubborn. That koala stole my heart. 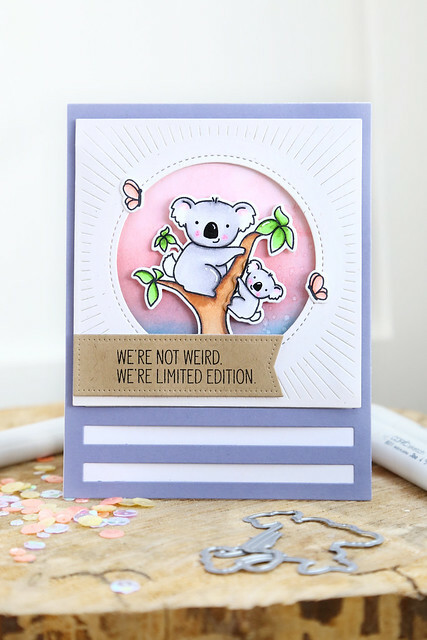 I did some ink blending and gave the koala and his baby center stage. The sentiment just cracks me up. I layered the Burst Elle-ments onto a Horizontal Stripes Elle-ments layer. These dies make it so easy to come up with a card design! I hope you like it! There's more to see on the AE blog this morning - click! 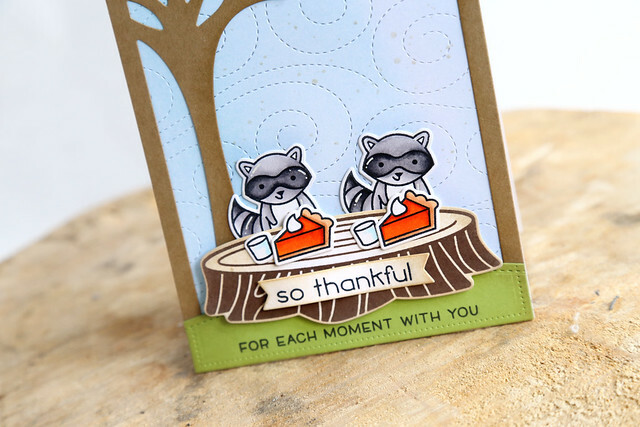 Lawn Fawn sneak peek week! Lawn Fawn is showing off their fall/winter collection all week long. Everything will be available for purchase near the end of August. I love the little fishing hole! I masked off the edges and stamped a few fish into the opening. 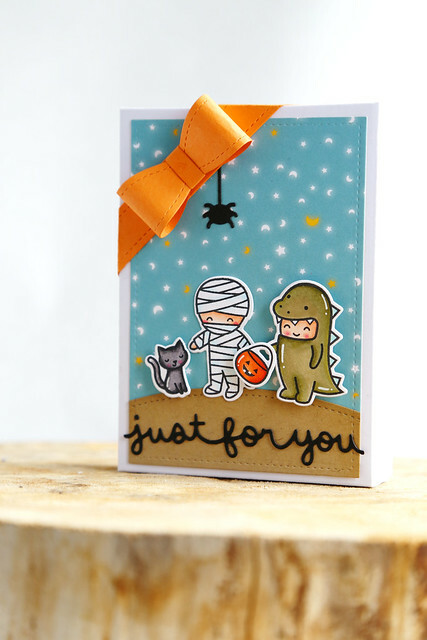 The mountain and hillside dies make it easy to create a very pulled-together card. Lawn Fawn is showing off their fall/winter collection all week long! Everything will be available for purchase near the end of August. I couldn't help but also add a black cat, courtesy of Bicycle Built For You. Perfect size! The box is nice and big, and can fit 4bar cards and envelopes. ORRRRR, you can fill it with treats of many sizes. I hope you like it! There's so much more to see on the LF blog this morning - click! Lawn Fawn 2017 fall/winter sneak peek week! Lawn Fawn is unveiling their fall/winter collection this week. It's a goooood one! 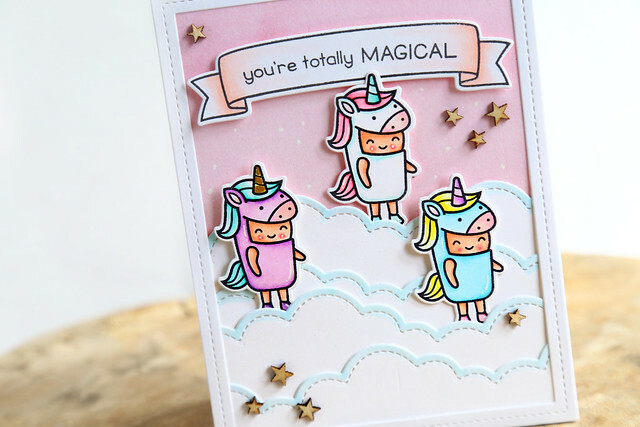 I don't know that I'm ready to craft in Halloween colors yet, though, so I used the new Costume Party set to make this girly unicorn card. I had so much fun coloring this little images! I mean, let's be honest. I'll take a piece of pumpkin pie any time of year! The giant tree stump is such a winner. I will be using it again and again for sure. And that racoon? So nice, I stamped it twice. ha. 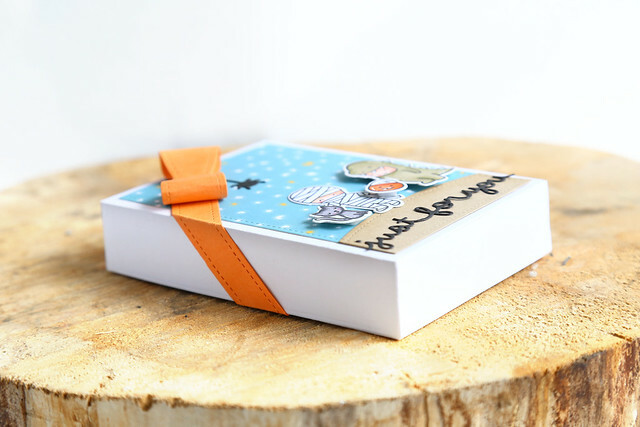 Check out the Lawn Fawn blog this morning for more new products and projects- CLICK! 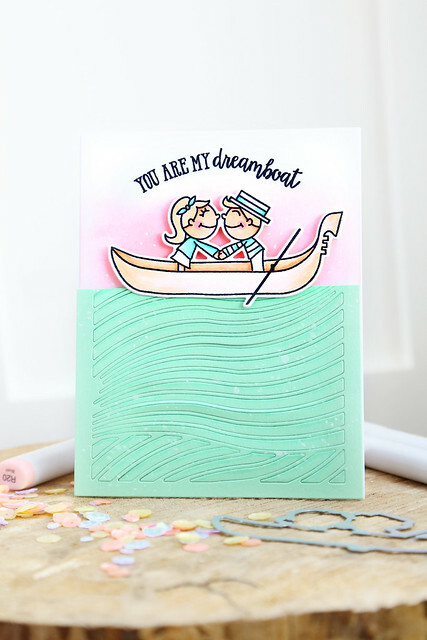 I'm here and on the Avery Elle blog today with a card that combines the newer Waves Ellements coverplate and a older favorite, Dreamboat. 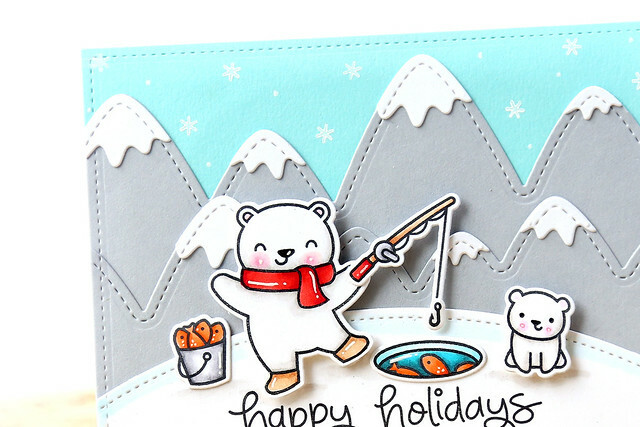 This is the kind of card that looks so much cuter in real life than in photos! The subtle, light coloring is really hard to capture. In any case, I chopped the waves die-cut to make room for the gondola on top. I love those wavy layers! I kept all of the pieces intact, and it gives a gorgeous texture that way. It's a little hard to see, but I added some shading to the waves with a copic marker and flicked white ink over the top to give even more interest to that piece. 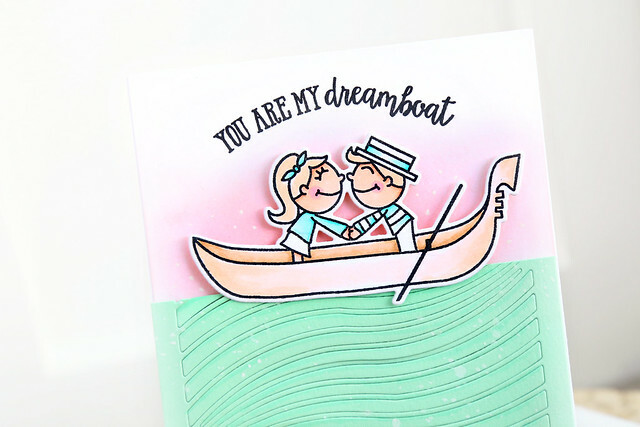 I did some pink ink-blending behind the couple, and kept the coloring of their outfits and hair very light. I curved the sentiment so that it mirrored the waves below. 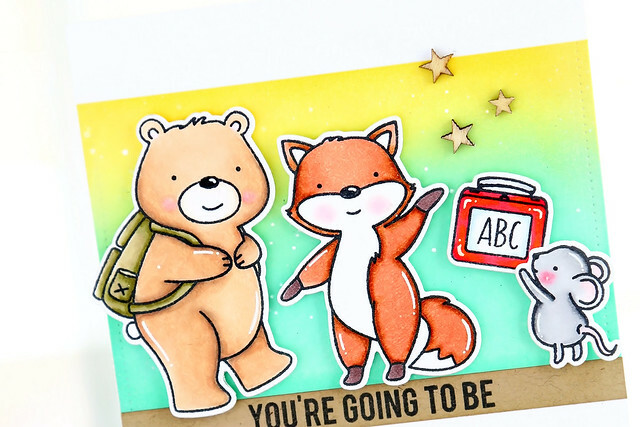 I'm here and on the NT blog this morning with a couple of cards using the new Schoolhouse stamp set. 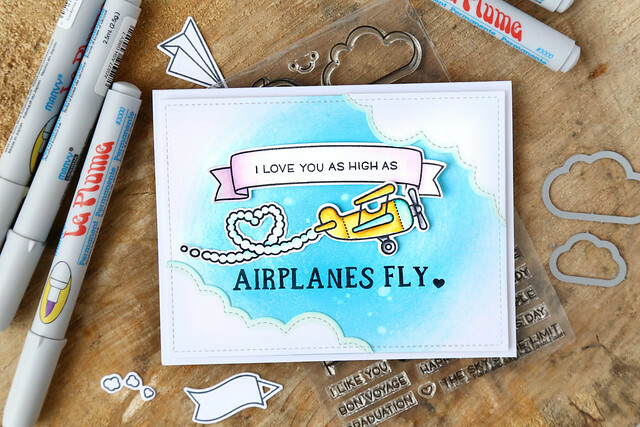 I would give this card to my kids on the first day of school. I used Schoolhouse and a sentiment from Awesome. The ink blending was done with mint and yellow, and I love where it blends to a green somewhere in the middle. The little mouse handing the fox his lunchbox is my fave! 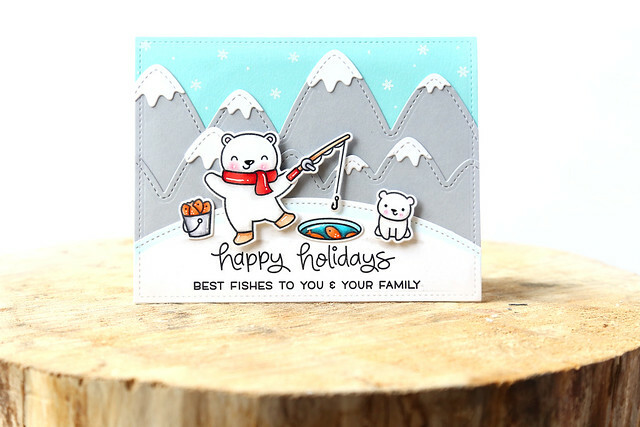 My second card shows how the little critters can be used outside of the school theme. The little mice are handing the birthday fox some treats and gifts for his special day. The little images are from the also-new Puppy's Favorite Things. Neat and Tangled new release day! It's release day over at Neat and Tangled! You can find all of the new release sets and dies in the store - CLICK! 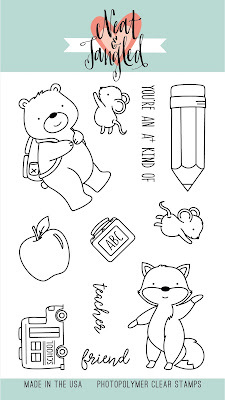 I used the little mouse and other smaller images from the new Schoolhouse set to make a sweet little tag. 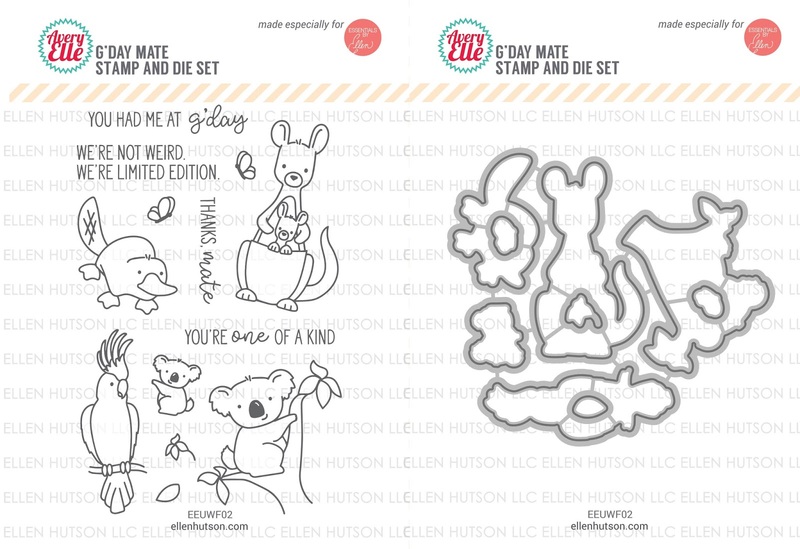 It's the last day of reveals over for this month's new Neat and Tangled, and we're ending off with a 3x4 set that I designed, Puppy's Favorite Things. It's a follow-up to the previously-released Kitty's Favorite Things. 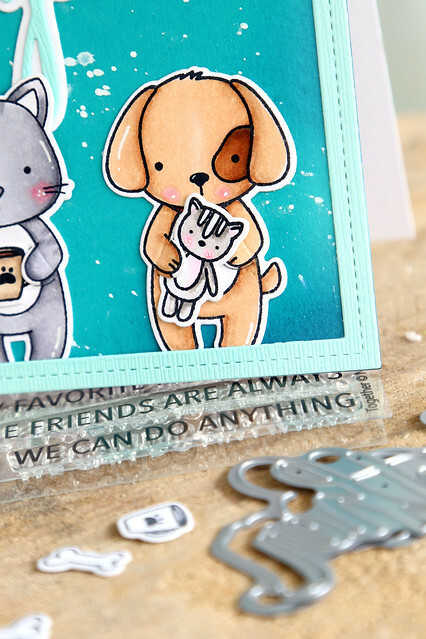 The puppy and kitty are sized to work together, and we've included a little die that you could use to cut around the puppy's paws, so that he could hold any of the smaller images in the set. The same die works with the kitty's paws as well! It was something that I always wished I had with the kitty set. so yay! 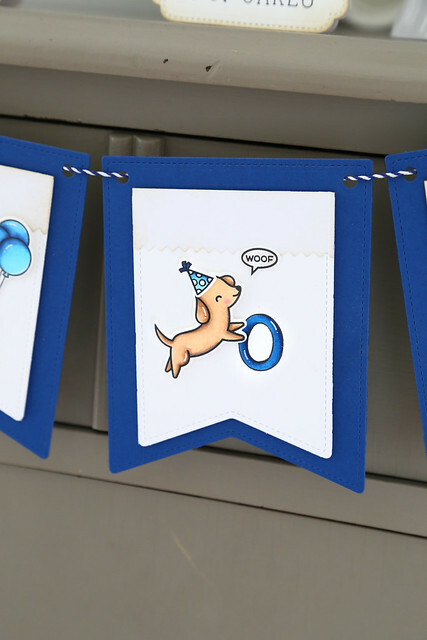 I colored 2 puppys and gave them party (or should I say PAW-ty) accessories. I also tucked the little tennis ball and food bowl at their feet. I used the new Modern Triangles cover-plate in red behind the images. I think it's so cool! To finish off, I flicked some brown ink over the kraft layer and assembled the card. 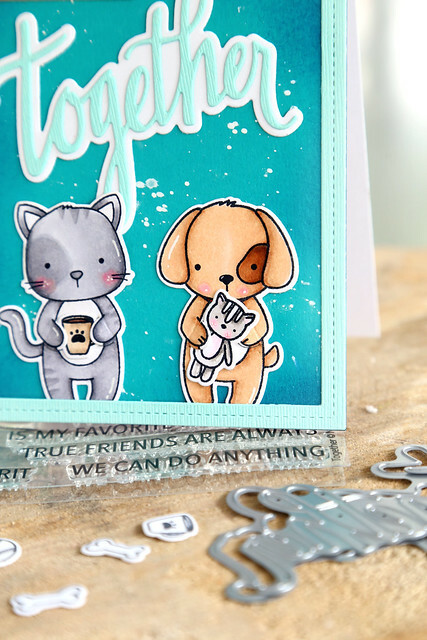 In case you missed my card from Monday, here's a look at the puppy and kitty (from Kitty's Favorite Things) together. I love that little stuffed kitty! And the fact that they can share all of their little images is so fun. Thanks for all of your excitement over my sets this month! It always puts a huge smile on my face to read your sweet comments. 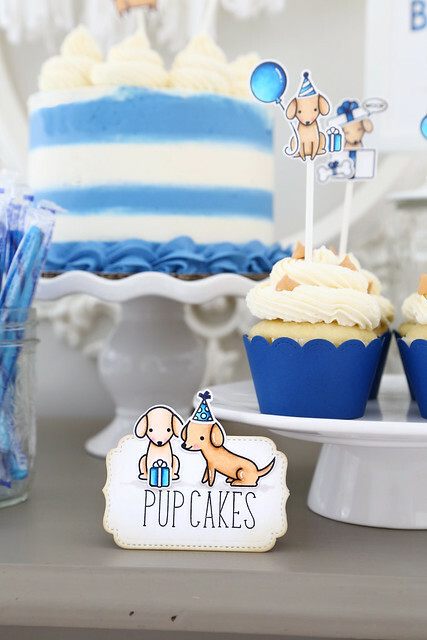 ***If you're looking for my Lawn Fawn puppy party, scroll down or click HERE. I'm so excited to show you the newest set I've illustrated for Neat and Tangled. 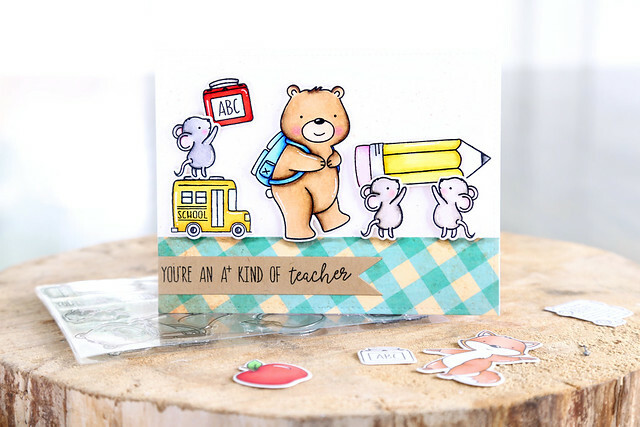 It's called Schoolhouse and is full of cute images that can be used for teacher cards and more. I have a few cards to show you, so strap in! 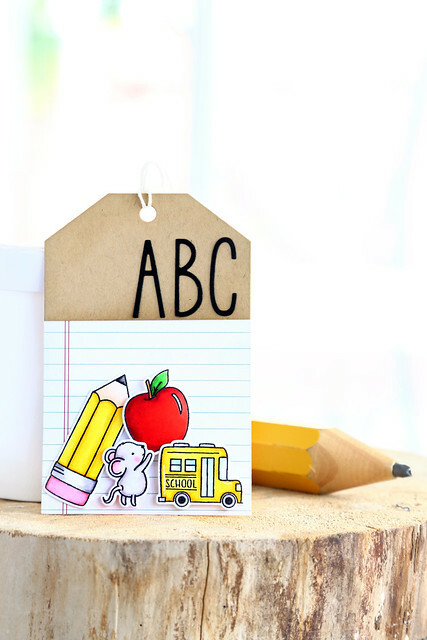 My first card is school-themed, for a great friend. 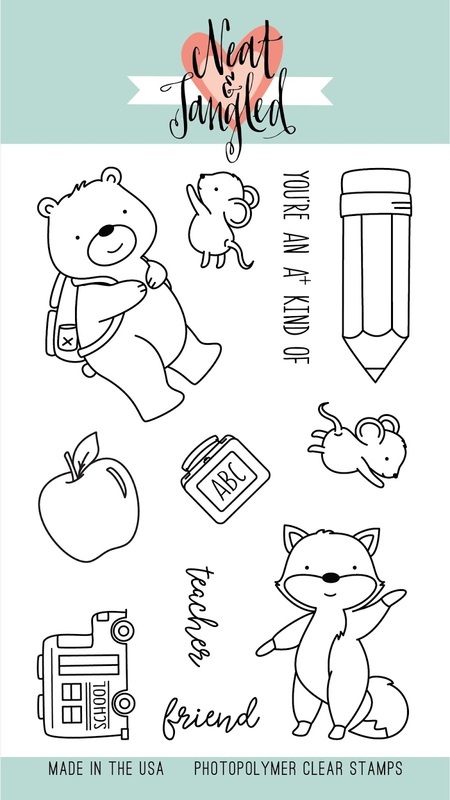 I've used the large apple and pencil images, and the backpack-wearing bear. I love that bear so much! I could see him being used on camping cards as well. 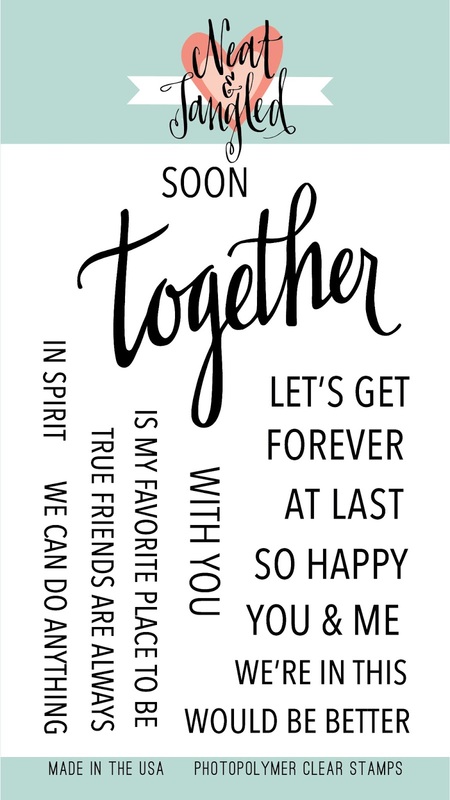 I stamped the first part of the sentiment onto the wavy banner from Scalloped and then die-cut the letters to spell friend. 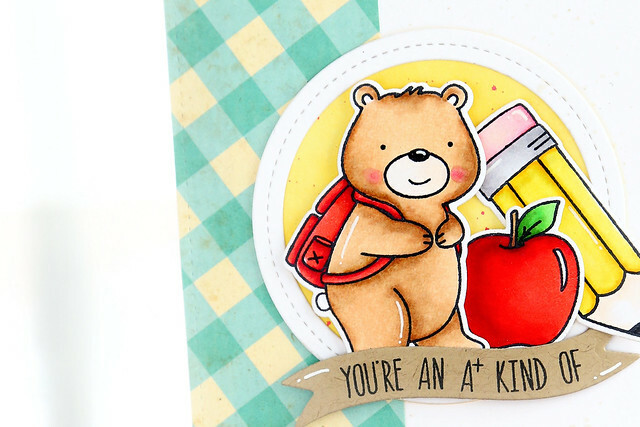 Using my MISTI tool, I made a variation of the previous card and stamped enough card fronts for the kids to color and customize for their teachers. I wanted the kids to put a bit of their hearts into the gift for the teachers who have poured their hearts out all year for their students. Can you pick out which child colored each card? I hope you liked this first look at Schoolhouse! 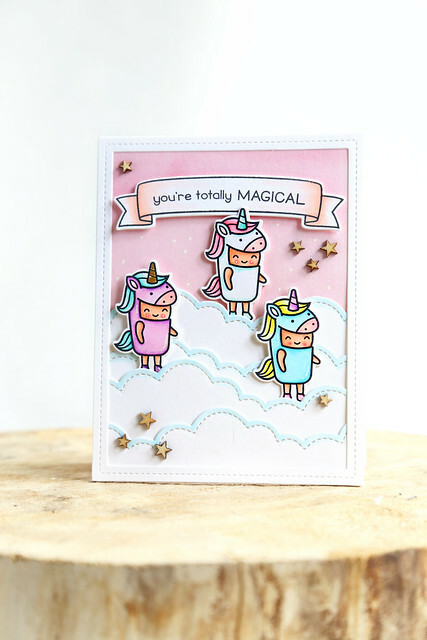 There is more design team inspiration on the Neat and Tangled blog this morning - click! As always, before you go, leave me a comment to be eligible for a 25$ gift card to the store. 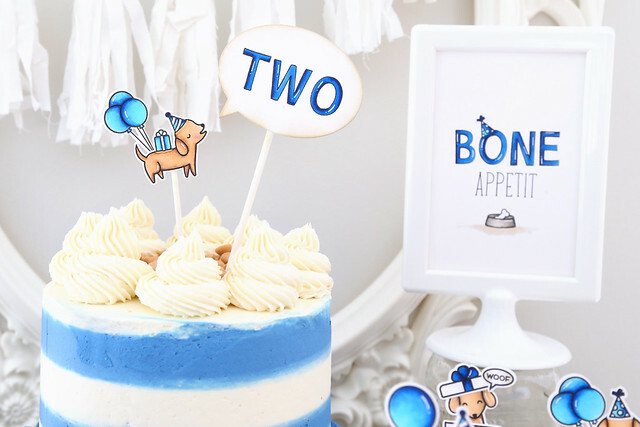 A few weeks ago my nephew, Nicholas, celebrated his 2nd birthday. 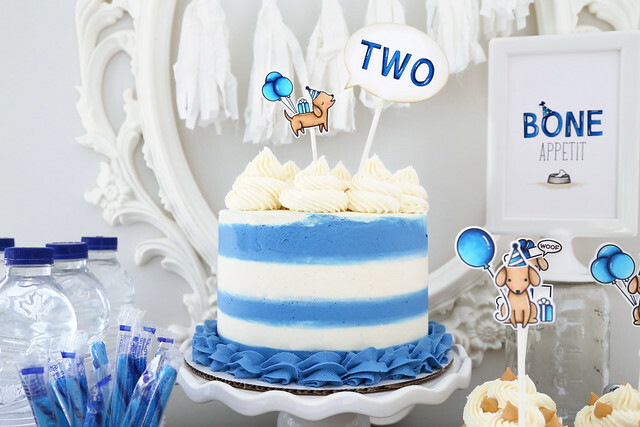 I asked if I could bake the cake and make all of the decorations. My sister kindly indulged me. 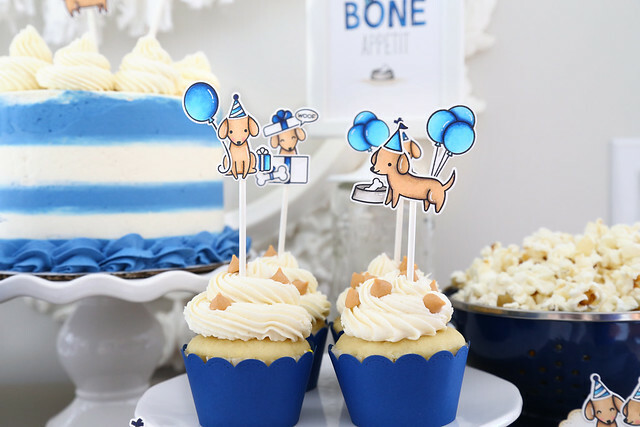 I used Lawn Fawn stamps and dies to create my party decor. The puppies and their accesories are some different sets: Happy Howloween, Happy Howlidays (no longer available), and Party Animal. 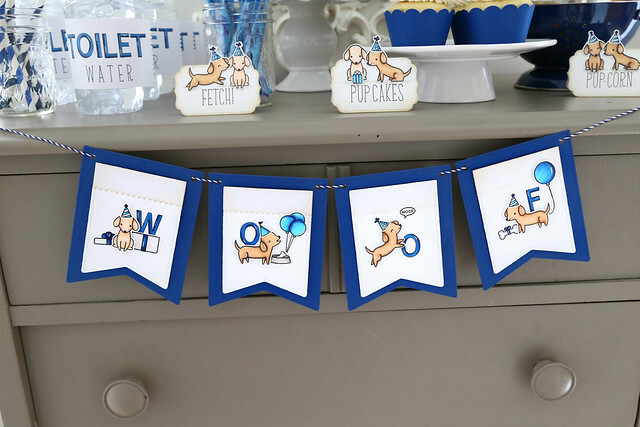 I love the banner that spells WOOF, with the dogs interacting with the letters in different scenes. Pup-corn! 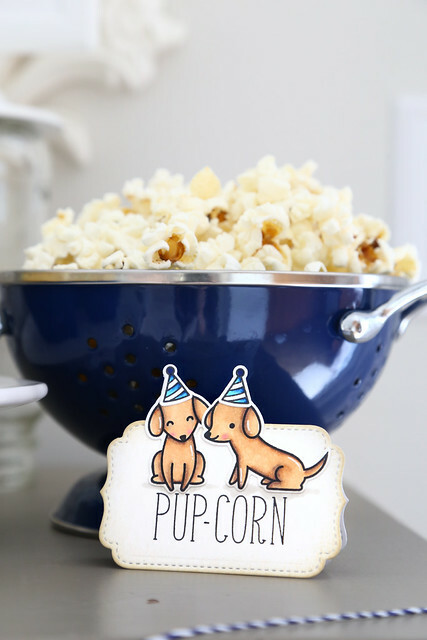 What's easier to stick on a party table than a bowl full of popcorn? But always a favorite. 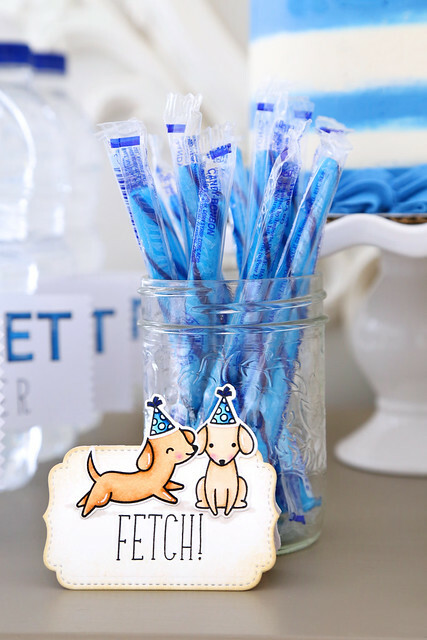 And I imagined that these lollipop sticks looked like something you'd ask a dog to fetch. I couldn't find the long pretzel rods I was picturing at first, but the colors on these were perfect for the table! 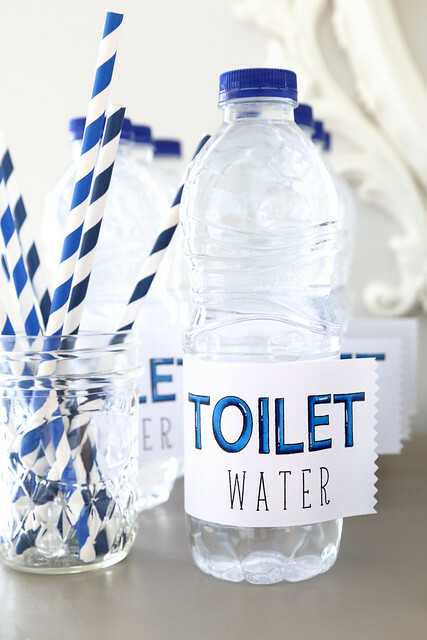 The kids were scared this was actual toilet water. Poor dears. We like to keep them real naive. 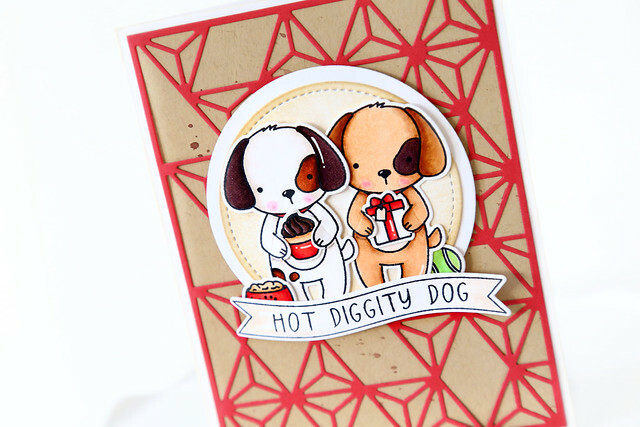 I stamped the letters using different Lawn Fawn alphabet stamps. 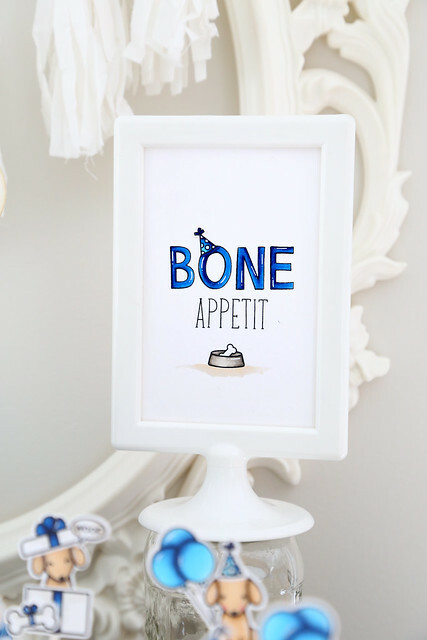 I also stamped a little sign for the table - Bone Appetit! I kind of love this the best. The howling dog is yelling TWO for the birthday boy. 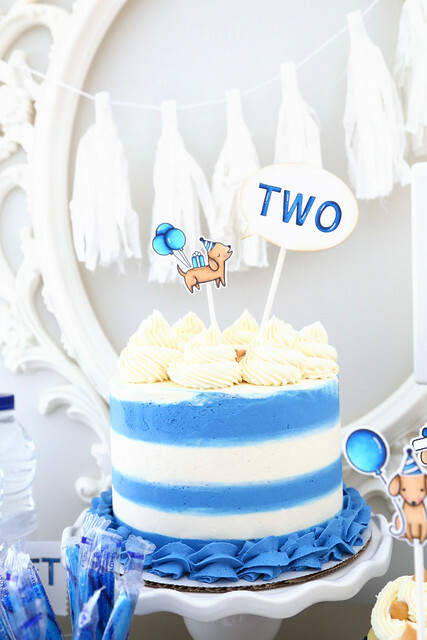 Let's talk a little more about the cake, shall we? On the other hand, I used a too-big cake board and didn't do enough to cover it up. And I didn't even see it until I was editing the photos. I couldn't keep up with everything I had going on, haha. IF I had stuck it onto a small cake board, I would have been so much happier with how it looks on the table. Oh well! No one seemed to mind much and the entire cake was gonzo by the time the party was done. 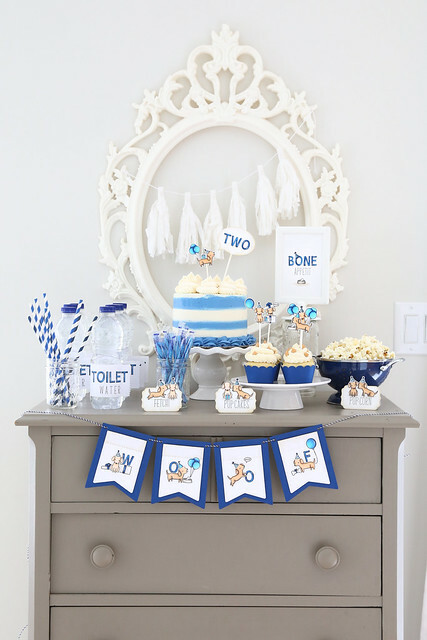 I hope you liked this look at Nicholas' 2nd birthday party! It was so much fun to put together! 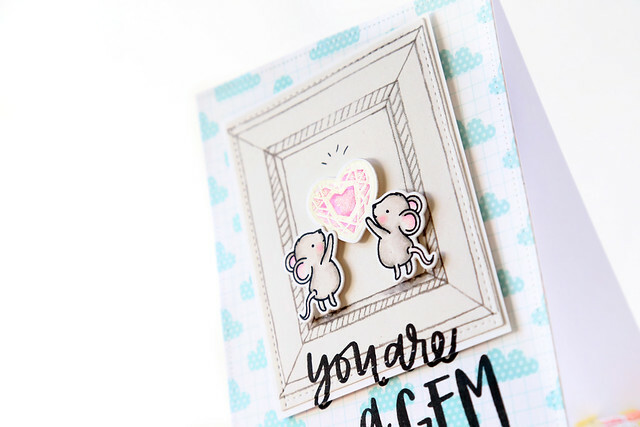 Today, we're showing off a hand-lettered gem by Danielle called... You're A Gem. 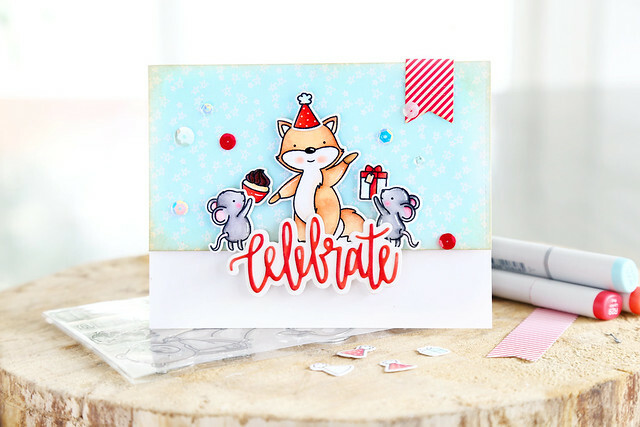 I couldn't help but enlist the help of my little mouse friends (more on them tomorrow!) to hold up that gigantic gem. I looked through my box of scrap patterned paper and found a sheet with frames all over it. I have no idea who made it, but I trimmed out one frame and used it to house my focal images. I heat-embossed the gem image, did some quick watercoloring so that the color wouldn't look too opaque, and then added some sparkle to it with a wink of Stella glitter pen. 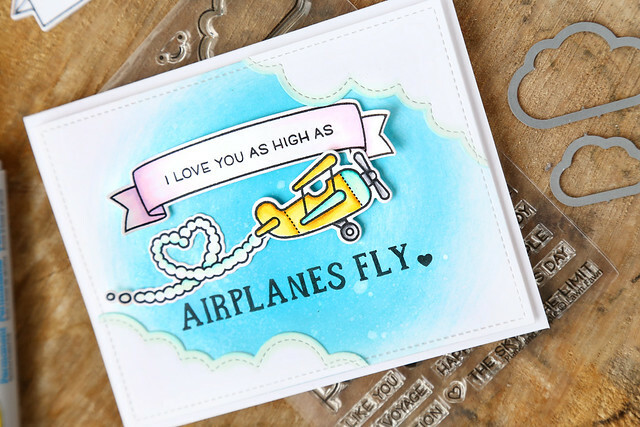 The sentiment was stamped onto the cloud paper, and then again onto the frame and lined up to appear seamless when you look at the card straight on. I hope you like it! I really can't wait to show you more of these cute mice and the rest of that set tomorrow. 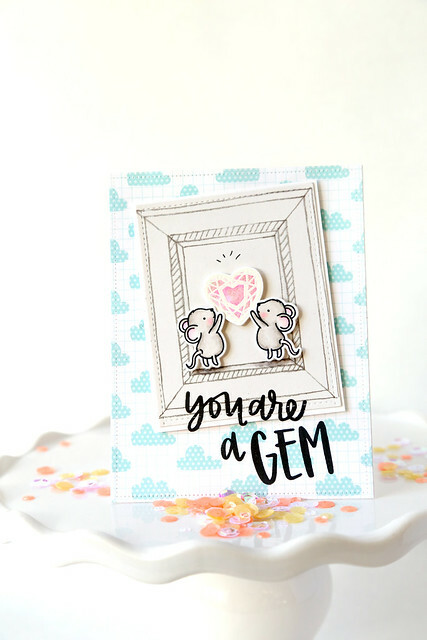 Head over to the NT blog to see more of You're A Gem - click! 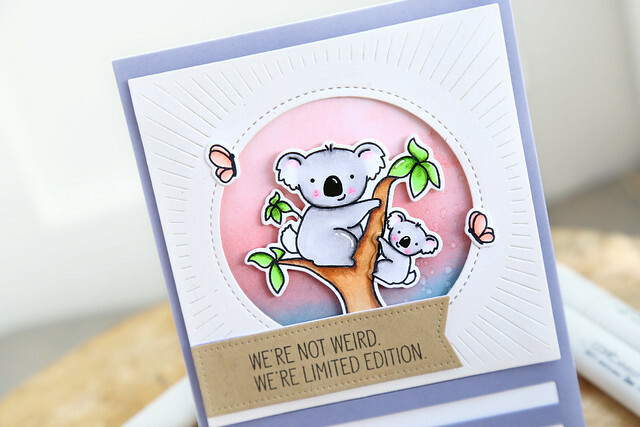 Welcome to Neat and Tangled's July release week! 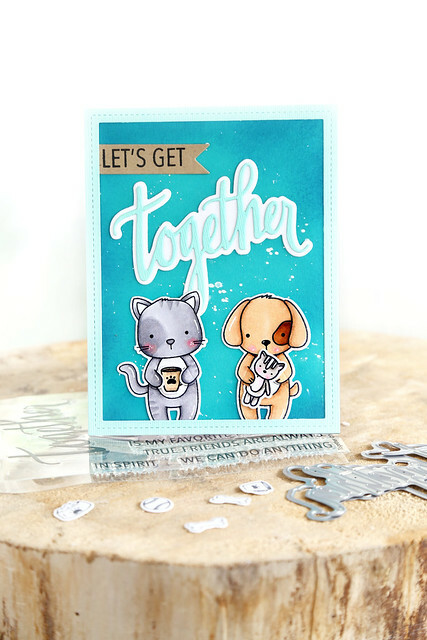 We're kicking things off with a first look at Together, a set designed by Miriam Prantner. 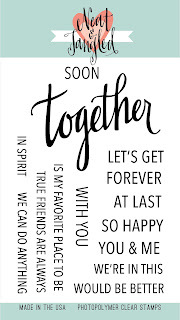 It features a large hand-lettered Together, and a slew of coordinating sentiments. I couldn't help but pair it with a couple of critters, one old and one you'll meet in a few more days! I love that the set gives you the option to stamp the word Together, or else die cut it like I did here. 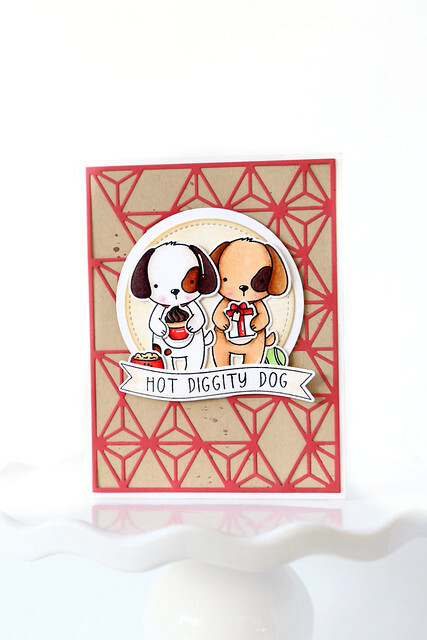 And the bigger dies gives a matting to either the stamped or die-cut version. I sponged a mess of blue inks onto the card base, and then splattered white ink onto it before giving it a paler mint frame. If you know our products, you'll raise an eyebrow when you see the cat, from Kitty's Favorite Things, holding the coffee mug! I designed the puppy's body to match the kitty's, and included an optional die that could cut around his paws... and the kitty's! Now, they could mix and match all of their accessories. The coffee mug and the stuffed kitty are just 2 of the little images you'll find in the set. More to come on Thursday so stay tuned! Check out the NT blog to see more, and don't forget to leave a comment before you go - you could win a 25$ gift card to the Neat and Tangled store.